This site aims to provide a complete source of information for anyone interested in the legendary Ford GT40 and its derivatives. 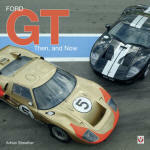 Illustrated with archive and modern photographs together with articles by leading GT40 historians such as John Allen and Wallace Wyss with contributions by Ronnie Spain and Bryan Wingfield with more to come. Eventually it will include information and photographs of every GT40 built including race results, colour schemes and magazine articles. The "Shop" section contains various posters and other items that you may wish to purchase. Hot favourite is "The GT40 Illustrated Parts List" which is an essential reference for those of you building or restoring GT40's. be they original cars or replicas. Contributions in the form of articles or pictures are always gratefully received. I have already received a good number of excellent photographs and I will be posting some of these shortly. Photos sent in by Glenn Sexton and Thierry Lesparre have been published in the updated "The Ford That Beat Ferrari" by Gordon Jones and John Allen. I am always on the look-out for good quality archive photos and have been known to actually pay money for them! If you have any, please get in touch. "Racing in the Rain" by John Horsman has recently been published by David Bull Publishing and what a cracking read it is, covering John's career starting with Aston Martin through the Ford/Porsche years at FAV/JWA and after. Find out more... including an in-depth review by John Allen. 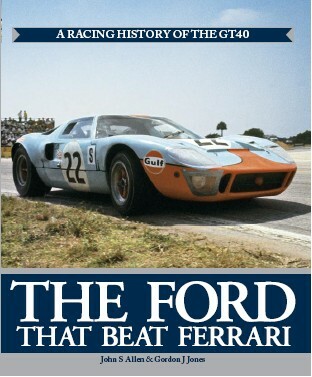 It's here at last, revised and updated "The Ford That Beat Ferrari" by John Allen and Gordon Jones. Site last updated: 18th May 2014.